Around every cobblestone street corner, there is something for everyone in Old San Juan, Puerto Rico. It has magnificent views and ancient buildings everywhere. You will hardly experience a moment that does not take your breath away while exploring this Caribbean island. Built on history and old world beauty, Old San Juan offers countless things to do and places to visit. With so many fantastic sites to see, it can sometimes be difficult to know precisely which ones to choose, especially if your vacation is short. There is no doubt; you will want to spend every moment you are in Old San Juan, soaking up the sun and taking in the sites. Whether you are a first time visitor or a returning one, it is essential to learn what you “must” do during your visit. It is how to make sure your vacation is the best, every single time. If you are a history buff, adventurer, or explorer at heart, there are numerous things for you to do and see. If you prefer oceans, sandy beaches, and waterfalls, there are plenty of those here too. Again, there is something for everyone. It will not take long to know why Old San Juan is a great vacation destination. There is a little bit of European, Spanish, Salsa, and Jazz, in every part of Old San Juan. It is great for friends, couples, and families to go and retreat from the bustle of their city lives. Old San Juan is a place that welcomes both relaxation and exploration. Its stunning views and flavorful foods know how to play with your senses. The colorful houses and sunsets know how to capture your heart. Old San Juan is one place on earth that has seized a period in time and refuses to leave it. Although it is a modern place, it also appreciates tradition. So, put on your sun hat and some sunscreen as we travel to this fantastic island to learn about the ten things you must do in Old San Juan. You will not want to leave this sanctuary until you do each on the list. Many are unaware of just how much history exists in Old San Juan. It is the oldest settlement within Puerto Rico and the historic colonial section of the city of San Juan. It is a National Historic Landmark District and is on the list of National Register of Historic Places. Old San Juan is a United Nations Educational, Scientific and Cultural Organization (UNESCO}, World Heritage Site. When visiting Old San Juan, it is important that you value its appreciation for history. Some would begin this list with a grand, expensive place or event, but we want to stay true to the Old San Juan way. Which is why we start with its beautiful historic buildings. Much work has gone towards restoring the historic architecture of Old San Juan, with each building as colorful as a rainbow. When you wander the centuries-old blue cobblestone streets, you will gain a better understanding of its colonial Spanish architectural roots and its importance. It is a delight to experience, and it is why you must make time to take in the candy-colored historic buildings of Old San Juan. It would not be an actual visit without visiting at least one of the famous forts of Old San Juan. There are two extremely famous ones, La Fortaleza and San Felipe del Morro and Castillo de San Cristobal. Each fort had crucial roles in the history of Old San Juan. To gain a better understanding of why forts were needed, we must travel back in time. From the 16th through to the 18th century, the island was a vital strategic base as Spain battled with other European powers for colonial control of the region. As whoever held Puerto Rico under its rule, it controlled the “door” to the Caribbean, Central America, Cuba, Mexico, the southeastern United States, northern South America, and all the places in between. In 1493, Spain colonized Puerto Rico, and it did not take long for Span to realize how the rest of Europe wanted to own this Island. To keep it from those lusting after it, the Spanish king ordered the construction of two forts, in the 1530s. This order is how La Fortaleza and San Felipe del Morro came to be. And both are extremely important to Old San Juan, Puerto Rico, and locals, making them must-see places before leaving the island. It is always fun to do touristy things when on vacation, and visiting a lighthouse is usually on that list. However, when you see the Castillo San Felipe del Morro Lighthouse, that is atop the walls of Castillo San Felipe del Morro, in Old San Juan, you will be thrilled you did. If you want to feel the history of Old San Juan, you must visit the oldest cathedral in the United States and the second oldest cathedral in the Americas, Catedral Metropolitana Basílica de San Juan Bautista or in English, Metropolitan Cathedral Basilica of Saint John the Baptist. This graceful historic landmark is a cannot miss experience. While there, be sure to also look at, the tomb of Ponce de León, the mummy of St. Pio, and the stained glass windows. There is no better way to learn more about all you can do at the second oldest church in the Western Hemisphere, then to visit it. It is a Church like no other. If you are looking to see both the charming streets and historical landmarks of Old San Juan, then you must go on a walking tour. During the tour, you will admire the beauty of Old San Juan and gain new insight into this historic place. You will be able to walk your way through time while enjoying the sights and sounds that make up the unforgettable, Old San Juan. You must do more than look at the culture and lifestyle of Old San Juan; you must become apart of it. Calle San Sebastian is a lively strip of cafes, restaurants, pubs, and bars. 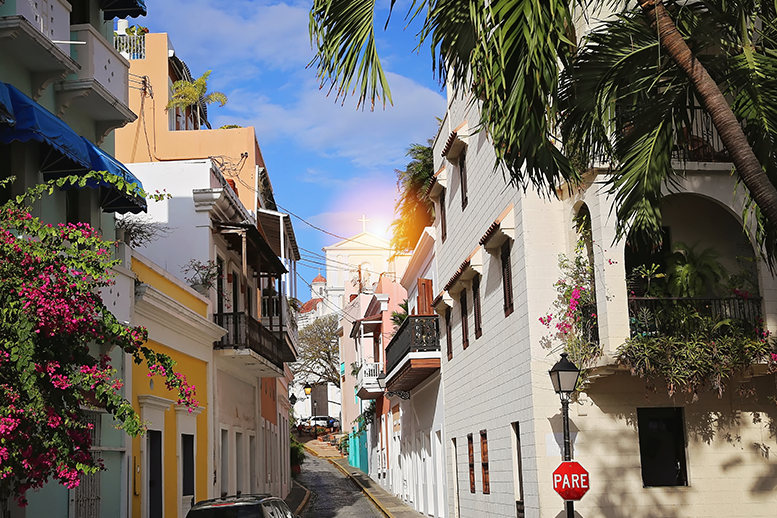 A famous but narrow street, it is the spot to go to find great places for dancing and bar-hopping while on vacation in Old San Juan. As you roam the old city core, you can experience the cuisine, culture, lifestyle, and history of Old San Juan all on one street. It is a place you must visit during your trip and if you go at the right time, you can enjoy the annual San Sebastián Street Festival. For those who know Spanish, then you might have picked up in the name that it is a rocky beach as, the word, Pena, translates to rock. When on vacation, you must dip your feet in the water and lay out in the hot sun. If you are a person, couple, or family that is always up for an adventure, then you will want to sail to a deserted island from San Juan called, Icacos. When you arrive, you can collect shells, explore the inhabited island, or choose to go swimming in the crystal-clear waters of the Caribbean Sea. When you choose San Juan Snorkel and Picnic Cruise you will have professional instructors who can show you the art of snorkeling. While there, view the breathtaking coral reef to see the many colorful tropical fish. It is an adventure only paradise can provide. One of the best ways to begin a fun night out while on vacation is to enjoy a beautiful sunset. You can decide to watch it on shore, but why not take the Bacardi Historic Sunset Boat Tour to make your sunset experience go up a level. The tour is approximately five hours, and you will visit different spots on your boat journey. You will see the world’s largest premium rum distillery and enjoy the most amazing views of Old San Juan from the waters of the harbor. Spend a relaxing afternoon on your boat that will take you to some of the most important landmarks, such as, Paseo de la Princesa, The Governor’s Mansion, San Juan Gate and Fort El Morro. Before heading back to your Old San Juan vacation rental, you will watch a magnificent Caribbean sunset. Last, but certainly not least, on the list of the things you must do is an outdoor activity you are sure to remember long after the flight home. You must go on this tour of Old & New San Juan + Rainforest’s Broken Bridge & Angelito Trail and Pond. Spend time going on a sightseeing tour in a private luxury vehicle. Your driver will take you through Old San Juan, Miramar, Condado, Hato Rey, Isla Verde, Santurce, the Rainforest, and back. Your guide will share all about the history, and you will learn about the must-see landmarks, like San Cristobal and El Morro Forts, El Convento, Saint John’s Cathedral, Ponce de Leon square, and La Rogativa. You will stop at San Juan’s art district in Santurce and visit the Rainforest, where you will see and hike Broken bridge and Angelito trail & pond. There is no doubt; you will learn about important history, explore various landmarks, and fall in love with this beautiful and ancient island. You will not be able to help yourself. Old San Juan is easy to love and hard to leave. But when your vacation time is up and you are about to board your flight, you will feel a sense of pure happiness come over you when reflecting on your entire trip. When you choose to go on a vacation to Old San Juan, Your time there will give you a mixture of history, dancing, exploration, and adventure. In other words, not only will you get your money’s worth, take a lot of photographs and videos, but you will also make many memories with the ones you love that will last a lifetime.